The Crew of Flightline flight FLT400C , consisted of the Commander and the Co-pilot, commenced duty at EGAA at 06.15 hrs on the 10 February 2011. The Flight Crew downloaded flight documentation including meteorological information for Belfast City Airport (EGAC), Cork Airport (EICK), and Dublin (EIDW) in a handling agent’s briefing office at 06.25 hrs. The aircraft departed EGAA, as flight number FLT41135, at 06.40 hrs on a short positioning flight to EGAC with the Commander as Pilot Flying (PF). The aircraft was empty on this sector. The aircraft arrived on stand at 07.15 hrs, leaving the Flight Crew with a 35 minute turnaround. A fuel uplift of 800 litres was made, with a total fuel quantity of 3,000 lbs being recorded in the aircraft Technical Log. This fuel load was sufficient for the planned round trip to EICK and back to EGAC with required reserves. The flight plan specified Waterford Airport (EIWF) as the alternate airport for the sector to EICK. No second alternate was nominated on the flight log or on the ATC flight plan which had been filed in the office of a Fixed Based Operator (FBO) in Billund, Denmark, at 03.31 hrs earlier that morning. Boarding of passengers was delayed due to the Flight Crew working on the passenger seats in the cabin. When the Flight Crew completed this task, the ten passengers boarded the aircraft and took their seats at random as seating was not assigned. Due to the limited number of passenger seats installed in the aircraft, no cabin crew were carried on the flight, nor were they required by regulation. The required safety briefing was given to the passengers prior to the flight by the Copilot. Flightline flight FLT400C was recorded airborne by the Flight Crew at 08.10 hrs and climbed to Flight Level (FL) 120. The aircraft Technical Log of Flightline flight FLT400C indicated that the Co-pilot was PF with the Commander acting as Pilot Not Flying (PNF). At 08.34 hrs the aircraft established communications with Shannon Air Traffic Control and handover to Cork Approach Control was made at 08.48 hrs. At that time, Cork ATIS was broadcasting that Runway (RWY) 35 was active and that Low Visibility Procedures (LVPs) were in operation. Cork Approach informed the Flight Crew that RWY 35 was the active runway and that a CAT II approach was available for RWY 17. The RVR on RWY 17 were passed by Cork Approach to Flightline flight FLT400C and were below the required minima for CAT I operations. The aircraft first established on the Instrument Landing System (ILS) approach to RWY 17 at 08.58 hrs and was handed over to Cork Tower. The RVRs passed by Cork Tower at 09.00 hrs were still below those required. The approach was continued beyond the Outer Marker equivalent point. 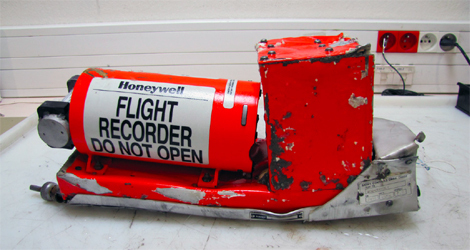 Descent was continued below the Decision Height (DH) of 200 ft and a missed approach was carried out at 09.03 hrs. The lowest height recorded by the TAWS on this approach was 101 ft.
Radar vectors were given by Cork Approach and a second ILS approach was then conducted to RWY 35, the reciprocal runway. Communications with ATC revealed that the Flight Crew considered that an approach to RWY 35, with the sun behind the aircraft, might make visual acquisition of the runway easier. The aircraft was handed over to Cork Tower at 09.10:45 hrs, 8 nautical miles (NM) from touchdown. The IRVRs passed by Cork Tower were below the required minima; the approach was continued beyond the Outer Marker equivalent point. The aircraft descended below the DH and a missed approach was carried out at 09.14 hrs. The lowest height recorded on this approach was 91 ft.
At 09.15 hrs the Flight Crew requested to enter a holding pattern for ‘fifteen to twenty minutes’ to see if the weather conditions would improve. The aircraft took up the holding pattern at ROVAL and maintained an altitude of 3,000 ft. While in the hold, the Flight Crew requested the weather for EIWF (note : alternate airport). Cork Approach provided the weather conditions at EIWF, which were below required minima. The Flight Crew of Flightline flight FLT400C then nominated Shannon Airport (EINN) as an alternate and requested its weather information. EINN weather was obtained and passed by Cork Approach; the conditions were also below required minima. Weather for Dublin Airport (EIDW), which was passed to the Flight Crew at 09.35 hrs, was operational but with poor visibility. During these exchanges, Cork Approach also offered to obtain the weather for Kerry Airport (EIKY). The conditions at EIKY were duly reported as good, with visibility in excess of 10 kilometres. At 09.45:22 hrs the aircraft reported established on the ILS RWY 17. At this point the aircraft was configured with landing gear down and flaps selected to 1/2. At 09.45:26 hrs, when EC-ITP was at 11 NM DME on the ILS, the IRVR (Touchdown) improved to 550 m (the required minimum), which was passed to the Flight Crew by Cork Approach. At 09.45:38 hrs, the flight was handed over to the Cork Tower and the Flight Crew reported to the Tower at 09.46:00 hrs passing 9 NM DME. The final IRVRs passed to EC-ITP at 09.46:15 hrs were 500/400/400, which were again below the required minima. The approach was continued beyond the Outer Marker equivalent point. As previously briefed by the Commander, he operated the power levers during the latter part of the approach. Descent of the aircraft was continued below DH. This was followed by a reduction in power and a significant roll to the left. Just below 100 ft radio altitude, a go-around was called by the PNF which was acknowledged by the PF of Flightline flight FLT400C. 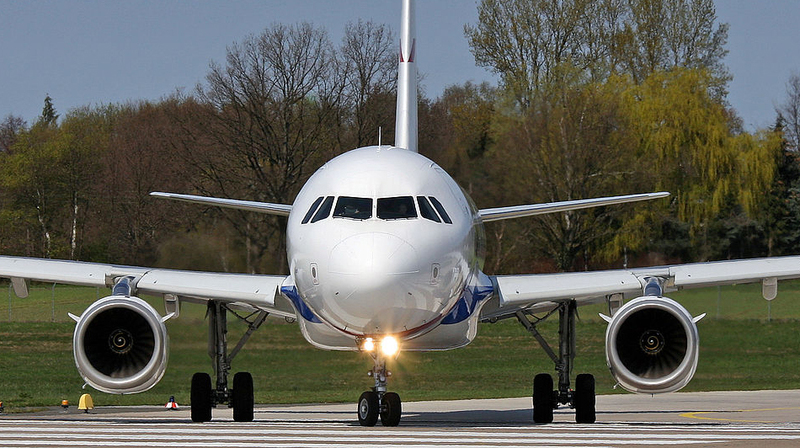 Coincident with the application of go-around power by the PNF, control of the aircraft was lost. 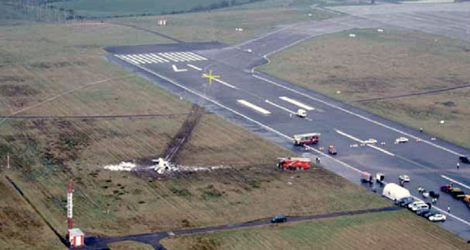 The aircraft rolled rapidly to the right beyond the vertical which brought the right wingtip into contact with the runway surface. 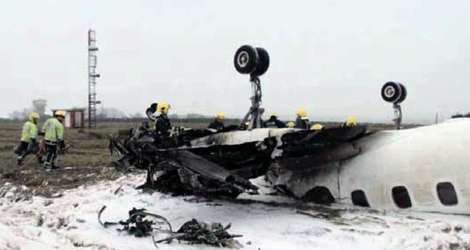 The aircraft continued to roll and impacted the runway inverted. The stall warning sounded continuously during the final seven seconds of the CVR recording. Impact occurred at approximately 09.50:34 hrs. The accident occurred in daylight, but under conditions of fog. Continuation of approach beyond the outer marker equivalent positsion without the required minima. Continuation of descent below Decision Height without adequate visual reference. 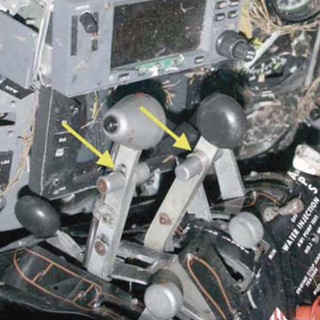 Uncoordinated operation of the power levers and the flight controls. In-flight operation of the power levers below Flight Idle. A torque split between the engines that became significant when the power levers were operated below Flight Idle. Tiredness and fatigue on the part of the Flight Crew members. Inadequate command training and checking during the command upgrade of the Commander. Inappropriate pairing of Flight Crew members. Inadequate oversight of the remote Operation by the Operator and the State of the Operator.